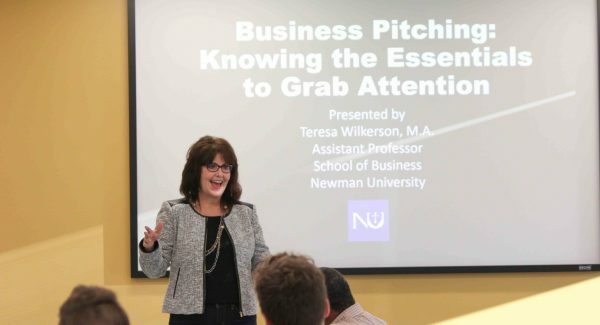 On Oct. 7, Teresa Wilkerson, assistant dean of adult and transfer studies at Newman University, kicked off the WSU Center for Entrepreneurship Business Booster Series. This series was created specifically for the self-made business owner, is aided by fellow business mavericks and includes three-hour workshops that are designed to practice skills that will spruce up one’s business. Assistant Dean of Adult and Transfer Studies Teresa Wilkerson hosts a workshop that focuses on business pitches for entrepreneurs. In addition to providing networking for students who would not necessarily have them elsewhere, these events allow for entrepreneurs to learn about different job opportunities by talking to people about the industry. While classroom knowledge alone can be limiting, hearing about what the outside world will be like in that particular field is helpful for deciding whether or not it is something you really want to pursue, Wilkerson said. Wilkerson’s presentation, entitled “Business Pitching: Knowing the Essentials to Grab Attention,” focuses on the basics needed to successfully pitch one’s business to an investor. Brett Andrews, Ph.D., dean of the school of business, was asked to be a mentor for the Entrepreneurs to Entrepreneurs of Wichita. 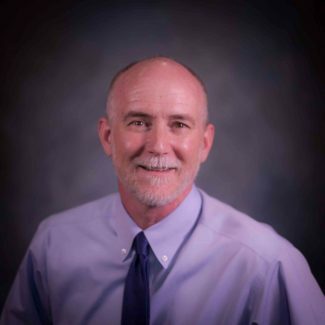 Wilkerson and Dean of the School of Business Brett Andrews, Ph.D. were asked to be mentors for Entrepreneurs to Entrepreneurs of Wichita (E2E), which focuses on activating, accelerating, and mentoring entrepreneurs in the area. Wilkerson has been involved with E2E since July, and was asked to help entrepreneurs who were accepted into the accelerator program. This provides the partnerships and additional help needed in order for companies to take the next step in their business. Mike Mathia, founder of KNOXX, an online career networking firm, said that the CEO of Occidental Management Inc. Gary Oborny, who is the chairman of the board for E2E, talked to private equity investors in Wichita and influential people who care about the city. Through the funds raised from that, they created the E2E accelerator. “I’m a 20-year recruiter,” said Mathia. “I had frustrations because I could never get beyond the resume to know who the candidate behind the resume really is.” At a young age, one may possess great intangible traits. However, on a resume it is difficult to convey them in a way that catches an employer or investor’s attention, Mathia said. 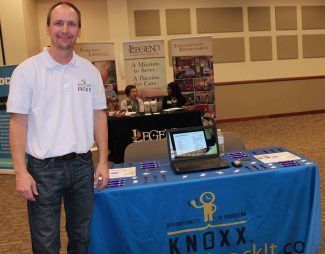 Mike Mathia, founder of KNOXX, participates in the Fall Job and Internship Fair at Newman University. 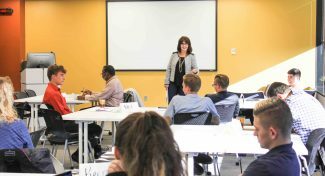 While acting as a mentor to entrepreneurs in E2E, Wilkerson said that the participants she met along the way ended up mentoring her in many ways and because of this, she now has a deeper experience into the world of entrepreneurship. It also allowed her to create a “mini workbook” for entrepreneurs to use to help them develop their own pitch and story development. “This opportunity has allowed Newman to be recognized in the community, and we are following the mission of the university by helping individuals who are trying to further themselves in the business world,” Wilkerson said. For any students or faculty who are interested in learning about entrepreneurship, Wichita’s One Million Cups event will be held at 8:30 a.m. on Wednesday, Oct. 19 at Wichita State Old Town. Attendance is free, presentations will run from 9 to 10 a.m. and will be followed by a question and answer session.